Find peace and serenity at the end of this road in the rarely available Turnberry section of Waterford. Enjoy coming home to this immaculately maintained villa with a welcoming and entertaining space. 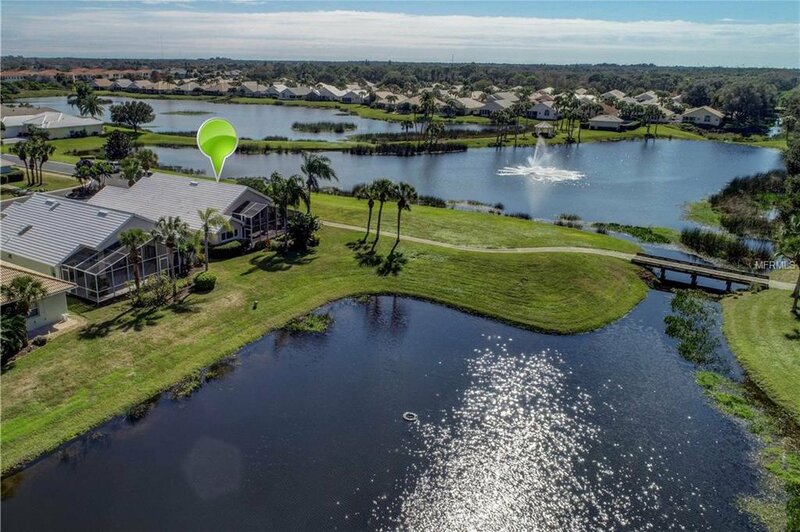 This villa style home is an end unit where your visitors will enjoy the breathtaking lake view with fountain surrounded by manicured golf course. Entering the front door diagonally laid tile draws your eye to the full 3 panel lanai doors that open to your extra-large covered lanai with beautiful pavers and views to a second lake behind the home. Entertain in the updated chef’s kitchen where you have plenty of space to store anything you need to prepare a wonderful dinner or hors d’oeurvres for friends and family. A breakfast island featuring the kitchen’s high-end granite allows you to watch the wildlife in the lake or the golfers while having your morning coffee. Escape to your split master suite and find a huge closet, accented carpet and a completely remodeled spa-like bath with double vanity and roman shower. Your guests enjoy the same treatment with their updated bathroom and gorgeous glass shower. In addition to the two bedrooms a separate den/office allows you to focus on the business tasks at hand. When you are ready to cool off, you can easily walk across the street and enjoy the community pool, or hit the legacy trail a few minutes down the road. Waterford is convenient to Venice’s beaches, downtown, I-75 where you can easily get to Sarasota’s cultural center, Tampa or Ft. Meyers.